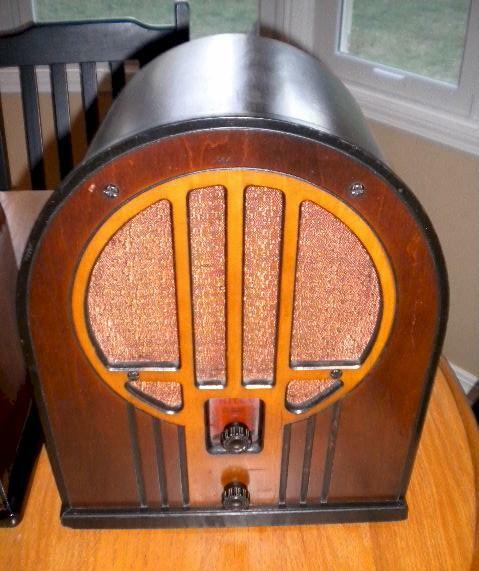 I purchased this Philco off of eBay last year. The radio has been given a thorough electronic restoration, alignment and test play. All capacitors are replaced in the Bakelite blocks. Original electrolytics are disconnected, but left in mounts and new miniature electrolytics are installed under chassis. The 84B is a regenerative superheterodyne using four tubes (80, 42, 77, 77) all big pin style. This cabinet has the original finish which looks great, and all veneer is 100% intact. The grille cloth and dial are original. There are no issues with play, it functions like new, and I receive numerable stations from my workbench in the garage with a wire antenna. No hum or distortion and full volume. This great Philco cathedral could easily be yours. 14"H x 12"W x 7-1/2"D.
You are visitor number 2,582 to this page.